Think about what that means for environmental policy. If we believe Moore’s Law in solar, then the safe bet in terms of behavioural reactions is not to react. Within a decade or two, energy will be socially as cheap as it is privately as cheap now. That means that changing habits for environmental austerity is not the way to go. If a solar breakthrough is now likely, in which market prices do we see it reflected?….Is there any reason, based in industry-wide market prices, to be optimistic about the near-term or even medium-term future of solar power? I don’t see it. I don’t see it either, but I think the correct answer to both of these objections is the same: everything is uncertain. The reason we should keep pushing on conservation and efficiency is because solar might not follow a Moore’s Law of its own. The progress so far can make us hopeful on this score, but it can’t make us so certain that we’re willing to put all our eggs in a single solar basket. That same uncertainty is the answer to Tyler’s point as well: the power industry hasn’t reacted to the drop in solar prices because the industry is still uncertain it will happen. And there’s more. The price of solar has been dropping exponentially for 30 years. That’s not a prediction, it’s a historical reality, and yet the power industry hasn’t so much as blinked. So why should we expect them to react to it now? The fact is that industries routinely fail to react to technological competition until it’s literally on their doorstep — or even tromping through the door and plonking down on the sofa to make itself comfortable. Hell, IBM stock continued to rise all through the 80s. It wasn’t until 1987 that investors finally figured out what technologists had known for years, namely that those newfangled PC things might put a serious damper on the growth of big proprietary systems. 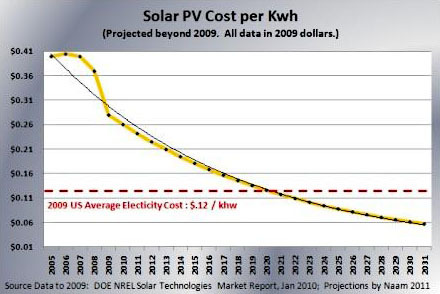 Solar power looks likely to get a lot cheaper over the next decade or two. That’s good news for residents of planet Earth and bad news for fossil fuel suppliers, but neither group should bet the ranch on it happening. For Earthlings in general, this means we should stay focused on lots of different ways of reducing carbon emissions just in case solar doesn’t pan out. For fossil fuel suppliers, it means they should spend some time hedging their bets, but not much more for now. For investors it means — well, different things for different investors. If you think it’s likely that the price of solar will keep falling, you should figure out ways to invest in solar. If not, not. Right now, price parity is far enough off that only a few far-sighted investors with lots of appetite for risk are likely to spend significant sums betting on it, which in turn means that broad markets aren’t yet affected. And they might never be. It all depends. But the fact that they aren’t reacting yet to something that’s at least ten years off doesn’t really tell us much about how promising the solar market is. All it tells us is that most investors don’t really have very long time horizons.